When Josh Zaret said he was throwing a “fun, casual pizza party” to celebrate the official launch of Gemstone Corporation’s new office building, design centre and showroom, he wasn’t talking about serving take-out 'za from cardboard boxes. Rather, he meant freshly prepared by Vittoria Trattoria in wood-burning ovens set up in the backyard at 252 Argyle Ave. 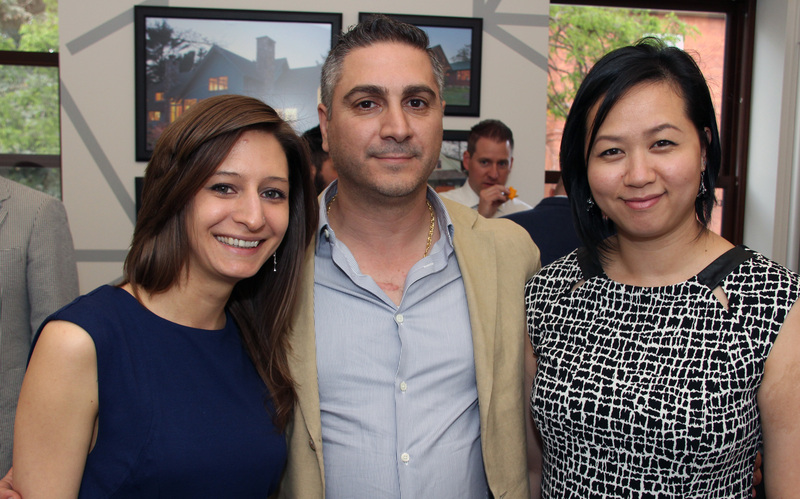 Dozens of friends, clients and suppliers turned out Thursday to offer their congratulations and to check out the beautiful new space that is now the headquarters for the family-owned custom home builder and real estate development firm. Gemstone bought the property two years ago from the Roman Catholic Archdiocese of Ottawa but it took throwing a party to motivate them to complete all the final details on the run-down heritage building. Gemstone spent many months restoring the house to create a spacious, bright and modern feel. Just as an example, it added tempered-glass to the front porch and balcony and touches of zinc cladding to the traditional red-brick exterior. “You’ve done a great job; this place was a dump,” well-known Ottawa real estate and business lawyer Lawrence Soloway was overheard telling Zaret. Special guests include Deputy Mayor Mark Taylor. He thanked Zaret and his father, Neil Zaret, president of Gemstone, for “changing the face of our community” and for helping the city to evolve. Coun. Jan Harder, chair of the city’s planning committee, had visited earlier that day. “I think that when you look at the designs that they deliver on street corners across the city you can see how they’re delivering modern designs for a modern, vibrant world-capital city,” said Taylor in his remarks. “At the same time, they are prizing the heritage aspects of a lot of these properties and putting them front and centre, and recognizing there doesn’t have to be a disconnect between the heritage aspects of our community and its history and the functional realities of what you can do with a modern building." Gemstone, he added, is among a group of developers in Ottawa that makes a difference, and for whom it's not just a business. "They pour passion into their work, and that is very clear when you walk through these front doors," said Taylor. "They pour passion into their work, and that is very clear when you walk through these front doors." Attendees included successful, award-winning architect Barry Hobin. He's working with Gemstone on its new development, Peridot, involving the construction of seven luxury homes on Prince of Wales Drive, near the Experimental Farm. Also seen was John Bassi, president of Bassi Construction (he lives in Gemstone’s upscale condo building by Patterson Creek, in the Glebe). Hobin design it, as well. Former Ottawa surgical oncologist Dr. Hartley Stern, CEO and executive director of the Canadian Medical Protective Association, was seen mingling in the crowd, as was popular radio host and Ottawa Senators PA announcer ‘Stuntman’ Stu Schwartz. He, like Dr. Stern, is a close family friend.